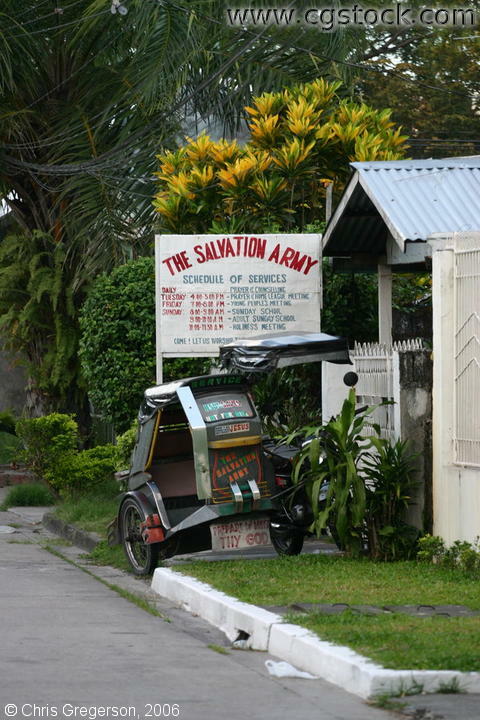 This shows the front portion of the meeting place for the Christian Group "The Salvation Army". This picture also shows a tricycle, a common means of transportation for short distance travels (i.e.. 1 to 5 kilometers). You can find these transportation type mainly for paid (around $ 0.2 to $ 0.5) public utility. The beautiful shrub at the back of the sign is a San Francisco plant which is very common ornamental plant in the Philippines.